It won't be officially announced until Monday, but the Minnesota Wild has signed yet another college free agent. Jarod Palmer, the leading scorer for the Miami University Redhawks and Fridley, Minnesota native has signed a one-year entry level deal with the Wild. Palmer, a left wing and a center, was a senior last season and racked up 45 points in 44 games on 18 goals and 27 assists. He ranked tied for 25th in the nation in scoring (with Casey Wellman among others), and helped the Redhawks reach the Frozen Four in each of the past two seasons. He never missed a game in his 169 game career and totaled 47 goals and 90 assists for 137 points. He was Miami's Rookie of the Year as a freshman and the team's Outstanding Senior this past season. He was also a Scholar Athlete. Prior to attending Miami, the six-foot, 195 pounder spent two seasons with the United States Development program. 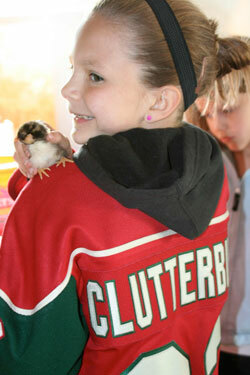 I'm ashamed that I didn't wish you all a Happy Earth Day yesterday, so here is by belated gift: it's a photo of Cal Clutterbuck fan, Lucy Gibbs and her brand new chick, Cluckerbuck. Onto hockey, and as we get deeper into playoff season, the games seem to get a lot longer, as evidenced last night by Pittsburgh and Ottawa. Very entertaining, however. And what about New Jersey? Yikes! That is not what I expected from a team with leaders like Zach Parise, Jamie Langenbrunner and Martin Brodeur. Brodeur got outdueled by Brian Boucher for crying out loud! Kevin Falness, who is working hard right through this wonderful weather we've been having, caught up with analyst Pierre McGuire in his latest PONDcast. The two of them gab about the playoffs, as well as the upcoming draft for the Wild. Enjoy. I was down in the Wild locker room today and there are still several Wild players milling about and getting their workouts in, or getting treatment. Greg Zanon, Clayton Stoner, James Sheppard and Cam Barker were among the players that I saw. Sheppard was walking without a crutch, which he was using last week due to his knee injury. However, Cam Barker was in a walking boot after undergoing surgery on his right ankle on Tuesday. The procedure was done to remove loose particles and requires three to four weeks of rehabilitation time. The big news on the injury front is Mikko Koivu. It was reported that Koivu would be undergoing minor arthroscopic knee surgery, but he will also be undergoing arthroscopic shoulder surgery to repair a torn labrum, which will sideline him for 14 to 16 weeks. He will be getting both procedures done in the next couple of days, which means he'll be getting back to full strength in August and he should be ready to go for training camp, and most importantly, the first two regular season games in his native Finland. Koivu flew home to Finland yesterday, and both surgeries will be done there. Part of this is because he will have family there to help him in his rehabilitation process. The other option would have been to have the procedure done here, and then he would have had to fly his family to the Twin Cities to assist him. While Koivu and Nik Backstrom were both able to get home to Finland, Antti Miettinen was not so lucky. He is still here in the Twin Cities due to the volcanic ash disrupting flights in Europe. He hopes to be on his way tomorrow, but may have to wait until Monday.